Architects, planners, and policymakers all gathered for a June 20th dinner at the Architectural League of New York, where they conferred this year’s President’s Medal on Christiana Figueres, former Executive Secretary of the United Nations Framework Convention on Climate Change (UNFCCC). The President’s Medal is the League’s highest honor and was awarded to Figueres for her role in negotiating the 2015 Paris Agreement; the multi-country accord created voluntary emission limits that were designed to keep global temperature rise under two degrees Celsius above pre-industrial levels. Medal recipients are selected by the League’s President and Board of Directors and recognize those who have had an outsized impact in art, architecture, the environment, urbanism, and design. 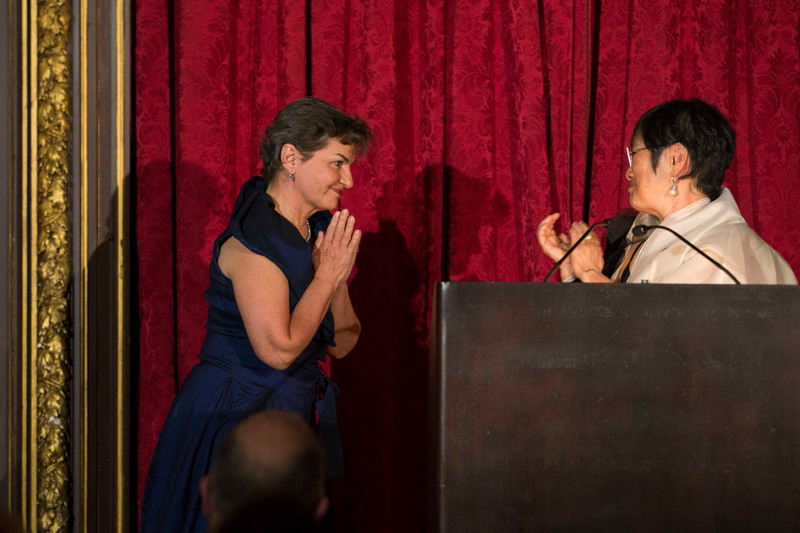 Ecologist and Manahatta author Eric Sanderson, landscape architect and educator Kate Orff, architect Anna Dyson, Architectural League Executive Director Rosalie Genevro, and League President Billie Tsien were on hand to laud Figueres. All of the speakers touched on Figueres’ role in bridging environmental concerns with the built environment, and the League’s role in advocating around climate issues. After stepping down from her UNFCCC role in the summer of 2016, Figueres now works as the Vice-Chair of the Global Covenant of Mayors for Climate and Energy, a coalition of cities and local governments that are combatting climate change through local action. Figueres is also the convener of Mission2020, an initiative to drastically reduce worldwide CO2 emissions, and long-term climate damage, by 2020.